Welcome, Erin Ball, Jinny Galley, Misha Baxter, Vicky Wilson, Linda Mortimer, Sarah Ridley to the Trainee Panel. Heather Drewett. On behalf of the agility community we would like to thank Heather for her many years of service to the agility world, judging all classes for us over the years. It is much appreciated and we hope she enjoys "life without agility"! 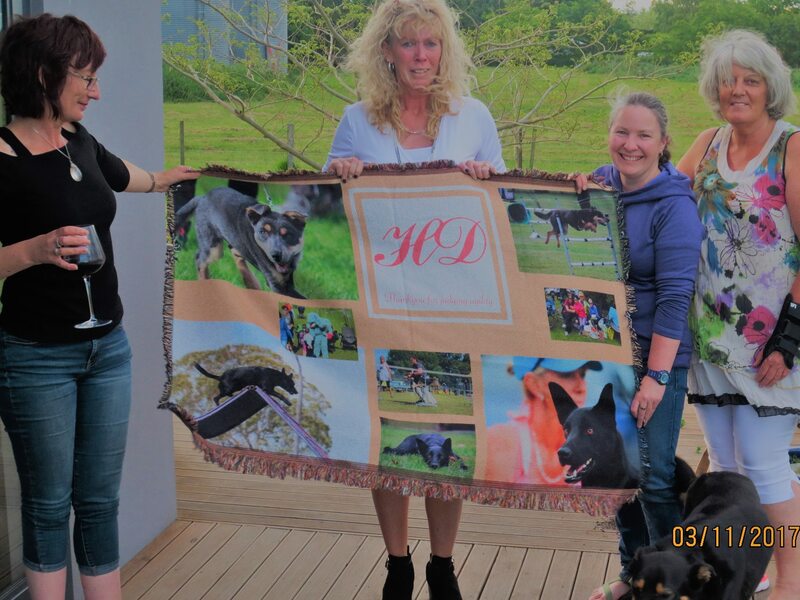 Below: Rug presented to Heather on behalf of the Agility Committee. GJP - Global Judging Programme, January 2019. Note: Judges wanting to change their status must apply no later than 28th February or 31st August, using the appropriate form. What are the latest changes to the regulations (effective July 1st) that affect judges? Collapsible tunnels with long chutes have a suspension in place. NOTE: There is a requirement in the regulations to comply with the various guidelines and Policy documents that the Agility Committee produces eg. Standing Orders, Measuring guidelines, Jumpers Guidelines. LEAVE OF ABSENCE (Dec 2017) We had an interesting situation come up a few weeks ago. The contracted Judge was unable to attend and fulfil his judging duties. The club hadn't contracted a reserve Judge, so the other Judges took on extra classes. In one instance, another Judge (who wasn't judging but was at the event), offered to stand in and help judge also, which isn't a problem. The question raised however, was If a judge is on a Leave of Absence, if this scenario came up again, and a LOA judge was at the event, could they stand in at the last minute to help out? The Agility Committee has had some lengthy discussion around this. There is no regulation around this specific scenario, however the Officiating Judge for any official event must be a licensed panel judge. Judges on a LOA do not pay licence fees and therefore are deemed to not be on a panel, and therefore NOT eligible to judge at the event.